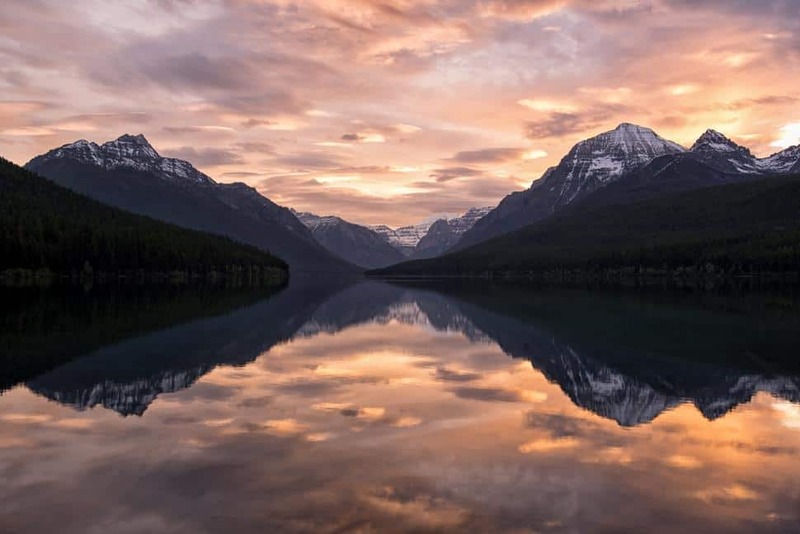 More than three million people visit Montana's Glacier National Park every year, and for good reasons: the dramatic landscape of ice-scoured granite peaks, lively rivers, alpine lakes and wildflower-decorated meadows. Add in the opportunity to spot mountain goats and grizzly bears, and most nature-lovers will be heading here pronto. As for hikers, there are a number of incredible trekking trails. 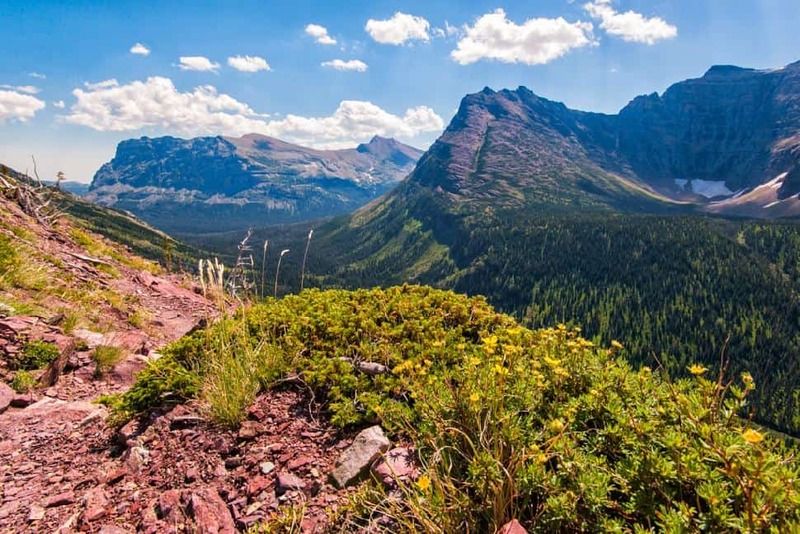 Here are 10 trails to tackle in America's Glacier National Park. Trailhead: Bowman Lake Campground, near the boat launch. Bowman Lake is the showpiece of the lightly travelled North Fork area in the northeast corner of the park. The scene from the foot of the lake is a classic: shores of wave-smoothed red argillite stones frame a plethora of peaks in the northern section of the park. Most visitors enjoy the view from the day-use area at the foot of the lake. But the 14-mile hike to the head of the lake—nearly level, never far from shore—puts on a nonstop show. Although the hike is popular with tent-campers and picnickers, few make it to the head of the lake and its backcountry campground. Although gaining in popularity, the North Fork is still relatively quiet, a long unpaved drive on the North Fork Road steering many visitors away; odds are, should you make it more than a mile or two from the trailhead, you’ll have the shoreline to yourself. Trailhead: Parking area accessible from the Going-to-the-Sun Road. Don’t let the crowds deter you: these are two of the park’s most popular hikes for good reason. Ascend alongside glacier-fed Avalanche Creek as it squeezes through a narrow gorge. Lunch on the shore of Avalanche Lake with like-minded visitors at this stunning setting. Meanwhile, the wheelchair-accessible Trail of the Cedars winds through a mature western hemlock and western red cedar forest. Some of the trees are estimated to be over 500 years old. Trailhead: Parking area near the Many Glacier Hotel. 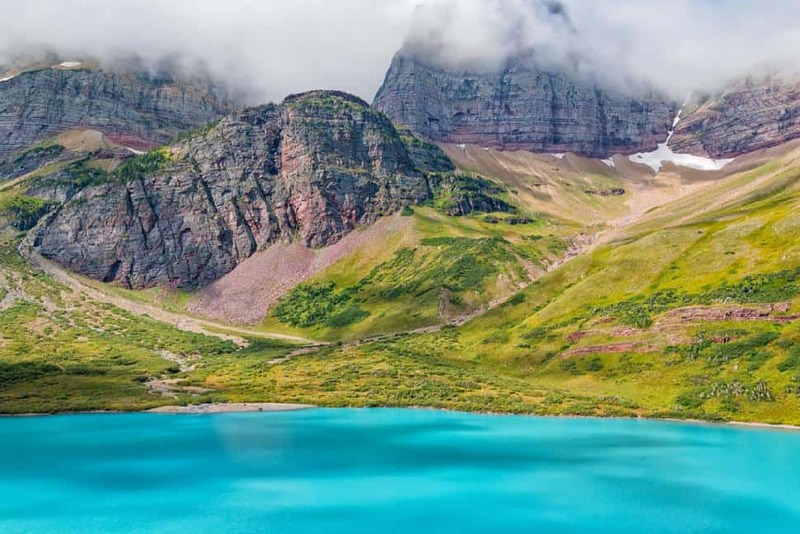 No, it’s not Photoshop: Cracker Lake’s techni-colour cerulean hue is unique even among Glacier National Park’s plethora of lakes. The wide path to Cracker Lake stays in thick timber for most of its approach to the lake; it’s one of few hikes in the Many Glacier portion of the park with limited scenic attractions along its length. But the reward comes once the trail reaches Cracker Lake. Trailhead: From the West Glacier entrance, drive to the Logan Pass Visitor Center. The trailhead begins on the north side of the road across the pedestrian crosswalk from the parking lot entrance. 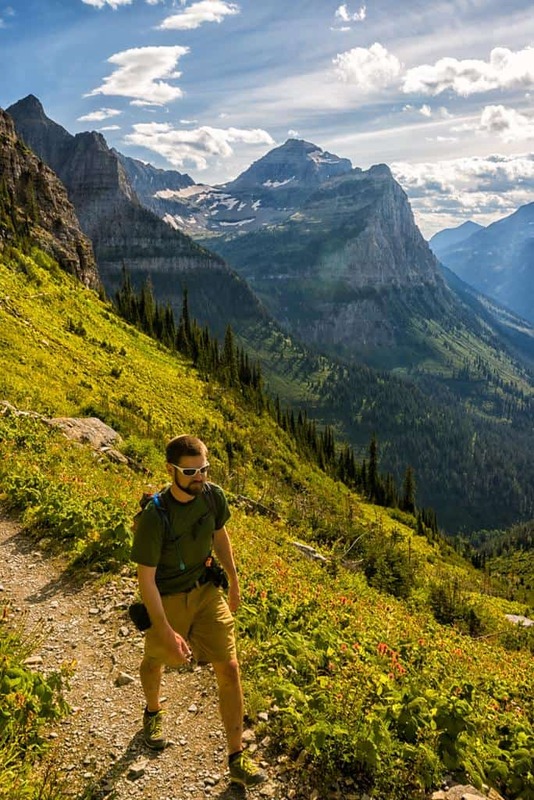 Considered by many to be the park’s premier trail, the trek to Granite Park Chalet along the Highline Trail is the hiking equivalent of Going-to-the-Sun Road: popular; narrow, although not as harrowing as it is made out to be; and worth the hype—and the hordes. Vast slopes, colourful flowers and breathtaking vistas reward the effort of a hike that gains little elevation. The vistas inspire every step, including views of the heavily glaciated horns of Mt. Cannon, Oberlin and Heavens Peak. In the historic Granite Park Chalet, backpackers will find rustic accommodations with 12 basic bunk-style rooms. Trailhead: Behind the Logan Pass Visitor Center. Thousands of sets of boots stamp the boardwalk to Hidden Lake Overlook during high season. The good news: alpine blooms on the broad terrace of Logan Pass’s layer-cake bedrock benches outnumber boots by a large margin. 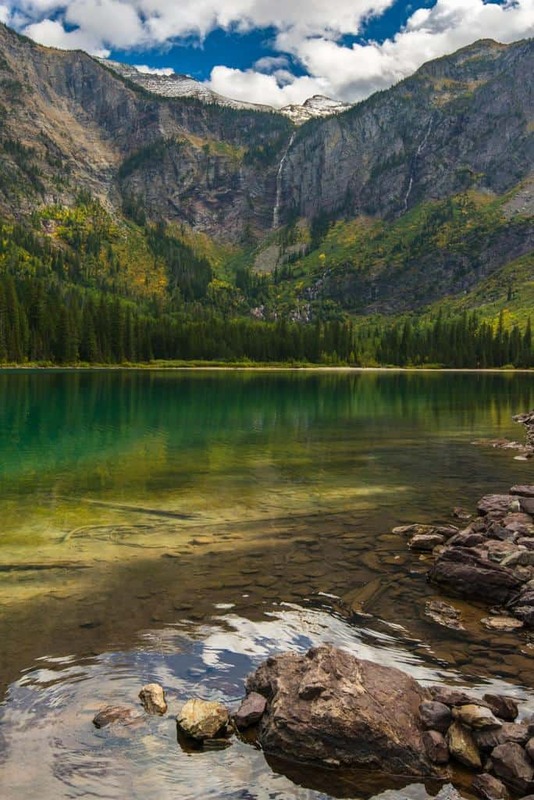 The better news: beyond Hidden Lake Overlook, mountain goats are likely to equal humans as it descends to Hidden Lake, which Bearhat Mountain caps in one of Glacier’s most iconic scenes. Water-polished argillite comprises the bed of this bracingly cold lake, and scattered pockets of subalpine fir provide privacy. It’s an appealing spot to rest, sans crowds, before the return climb to Hidden Lake Overlook. 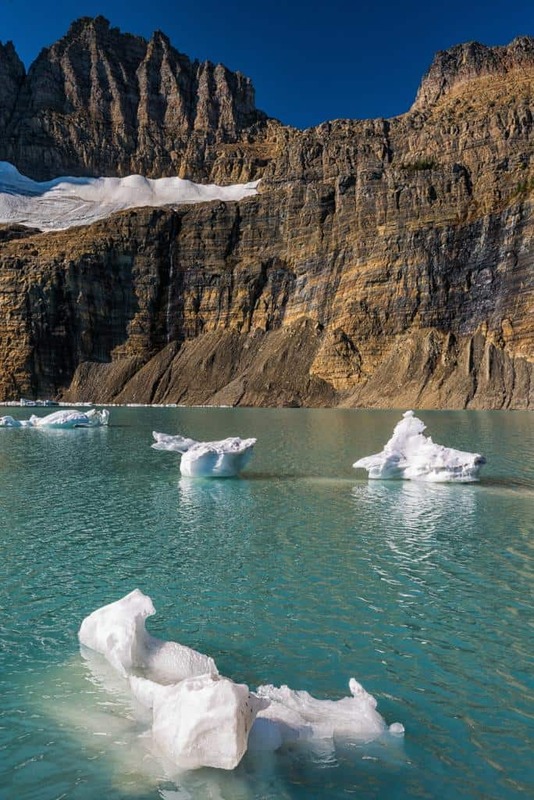 The roughly 10-mile roundtrip treks to Iceberg Lake and Ptarmigan Tunnel offer nearly nonstop views of the dramatic cirques and flower-draped slopes typical of the Many Glacier area. 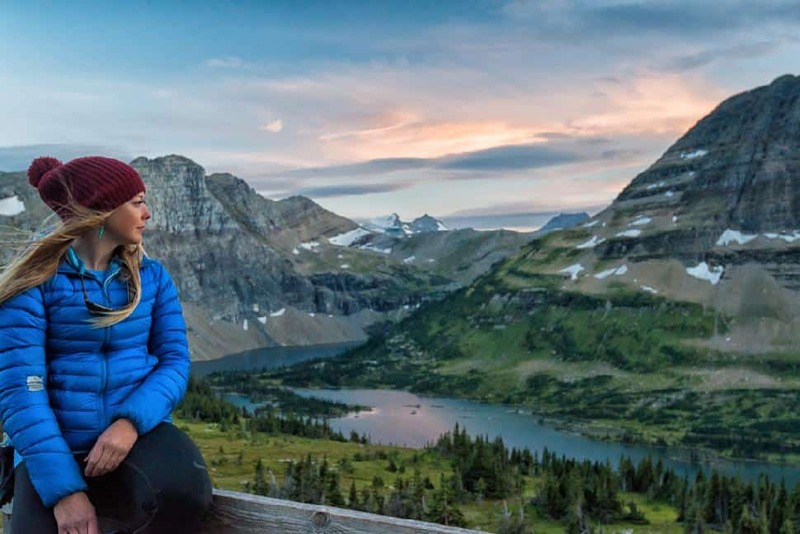 The distance is little deterrent to crowds, especially because Glacier National Park’s shallow, stock-grade climbs and soft, smooth tread enable higher-mile hikes than many tourists are used to. 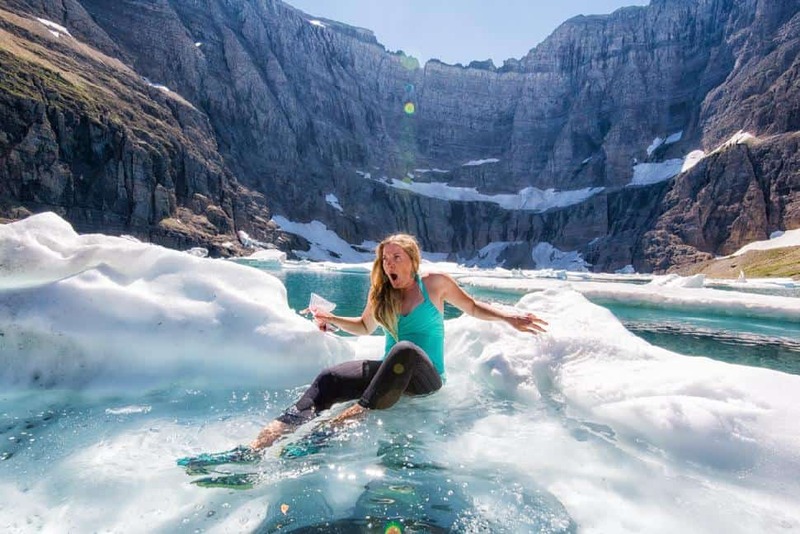 The stunning destinations—an amphitheater of an ice-bath in which to soak sore legs and a mountaintop tunnel—will spur hikers onward. Trailhead: Parking area just before Cut Bank Campground. On Triple Divide Peak, raindrops and snowflakes that land mere inches away from one another on this mudstone summit, itself an ancient ocean floor, end up thousands of miles away in the Pacific, Atlantic, or Arctic Oceans—a phenomenon repeated in only one other place in North America. Fortunately, it’s a much shorter trip there and back for hikers intent on reaching one of the centerpieces of the park, geographically and visually. 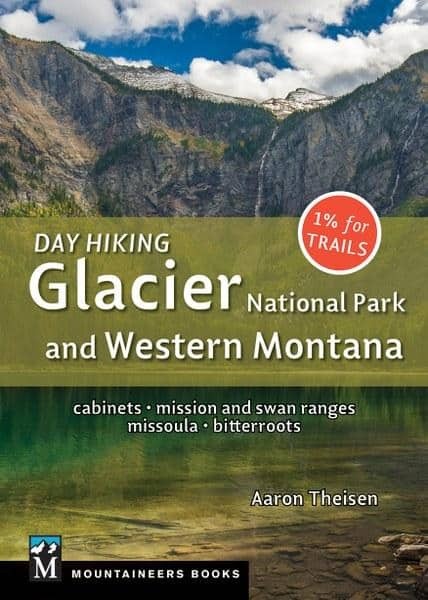 This hike offers a highlight reel of Glacier’s defining characteristics. Easy shoreline ambling leads to alpine meadows profuse with wildflowers. Mountain goats and bighorn sheep scramble on the steep surrounding slopes, and the trail passes through prime grizzly habitat; bears can often be spied below the trail. Grinnell Glacier Overlook grants hikers view of the 152-acre namesake glacier, the Garden Wall, and the Continental Divide. Upper Grinnell Lake derives its unique milky-white color from the melting glacier at its head. 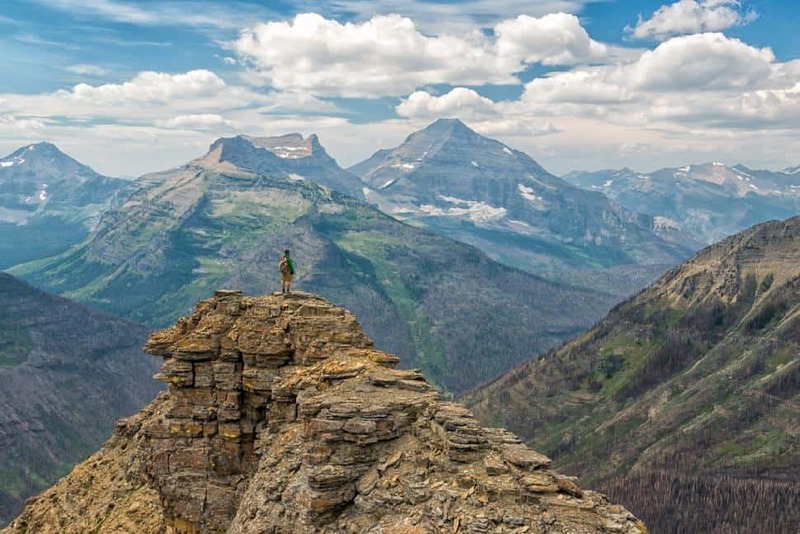 Stand atop one of the highest maintained trails in Glacier National Park. Naturalist George Bird Grinnell named it after a Blackfoot Indian named “Sai-yeh,” which translates to “Crazy Dog” or “Mad Wolf.” Siyeh Pass once hosted one of four locomotive bells in the park, a Swiss Alps tradition, borrowed by advertising agents for Great Northern Railway and Glacier Park Hotel Company in the 1920s, that allowed passing mountain travelers to ring the large bells. In 1943 the park donated the bells to a wartime scrap-metal drive, but the views still ring out: of the long shoulder of Mount Siyeh ahead, and the Boulder Creek Valley, bulldozed by an ice-age glacier, below your feet. Quite possibly the premier alpine traverse in the park, the Dawson-Pitamakan loop is long but within the realm of done-in-a-day trips. Hikers will encounter flatlanders and first-time visitors to the park over the course of this hike. Scale two wind-battered alpine passes while enjoying near-constant views of the tightly stacked summits of the park’s interior. 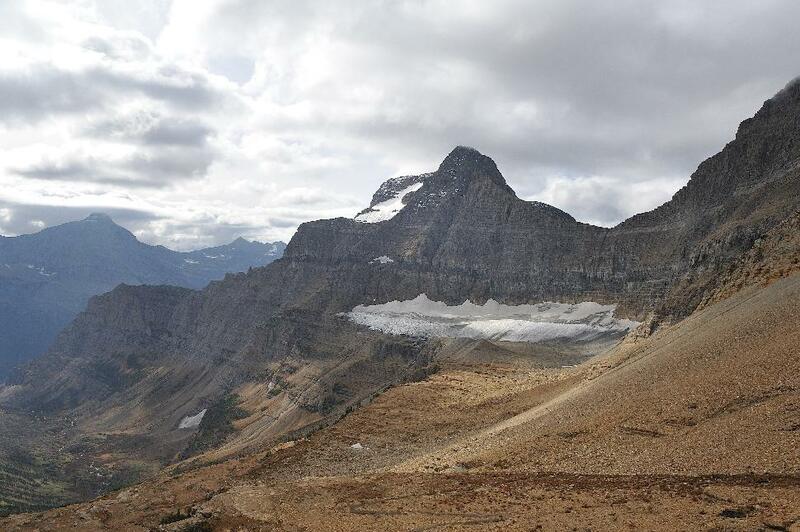 If Glacier National Park is the backbone of the world, this is the giant’s skeleton laid bare. Which hiking trail will you try first? P.S. Did you enjoy this list of hiking trails? 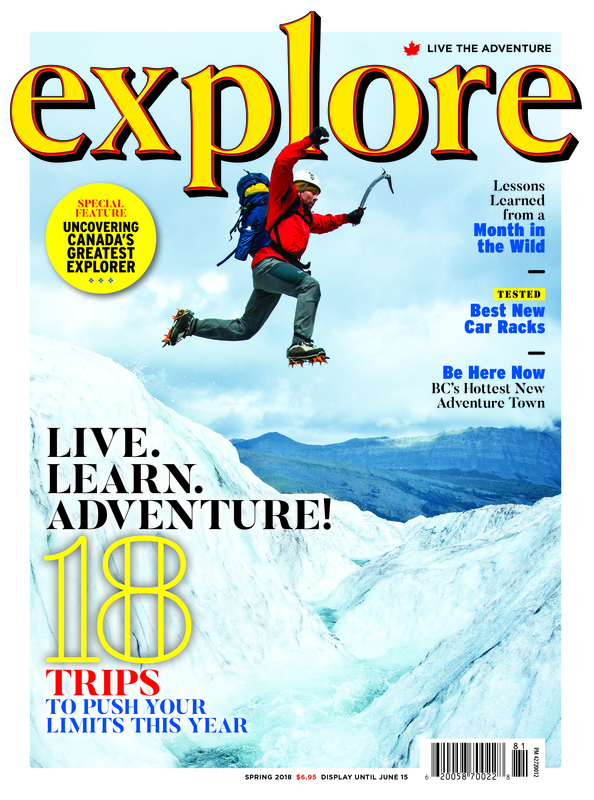 Do you want more adventure inspiration, specific trail recommendations in YOUR area, and a community to connect with like-minded explorers and adventure experts? 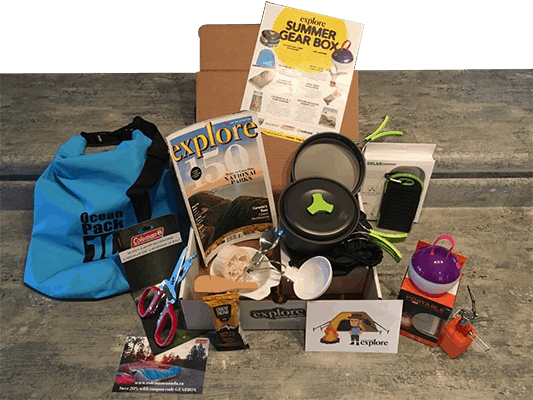 We include all that and more in our "Live the Adventure" Club seasonal subscription box.